An oxygen-rich lake, unreachable for the past 14 million years and buried beneath a thick sheet of ice, is about to be penetrated by a drill bit from a faraway place. It's possible that special life forms have adapted to live in this extreme environment, and scientists hope to learn more once they can analyze water samples. 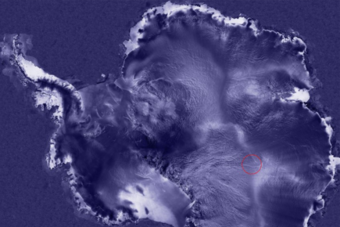 No, sorry, it's not on Europa - it's in Antarctica. But the environment of Lake Vostok, which Russian scientists are about to drill open, is very similar to that Jovian moon and to Enceladus, a frozen satellite of Saturn. Astrobiologists are among those eager to uncover Lake Vostok's Miocene-era secrets. The Antarctic Treaty Secretariat, a body set up to protect the frozen continent, approved a Russian team's process to extract water from the lake while preventing contamination, according to New Scientist. By the end of this month, a team from Russia's Arctic and Antarctic Research Institute (AARI) in St Petersburg expects to hit water. The lake's water pressure will push the drilling fluid up into the borehole, where it will freeze. Next year, researchers will return to extract that ancient water and analyze its contents. Efforts to drill into Lake Vostok have been stalled since 1998, when the treaty organization stopped the Russian team's work until further environmental studies could prove the lake would not be polluted. Later studies showed this would be tricky - in 2003, NASA astrobiologists said the lake's high nitrogen and oxygen levels would cause the water to fizz like a shaken soda can, opening the lake to possible contamination and even posing a threat to the scientists. Lake Vostok has oxygen levels 50 times that of other freshwater lakes, so scientists believe life would have had to evolve protective enzymes or other adaptations to survive. If so, these extremophiles could have implications for life on Enceladus or Europa. No one is sure where the ice-water boundary lies, so scientists are not sure when they'll break through.